Drug-related overdose deaths increased by 23.4 percent across Pennsylvania last year, according to an annual analysis conducted by the Drug Enforcement Administration. Pennsylvania counties reported 3,383 drug-related overdose deaths in 2015, up from 2,742 deaths reported in 2014. That gave Pennsylvania a drug overdose death rate of 26 per 100,000 people – well above the national rate of 14.7 per 100,000 people. It also easily exceeded the rate of 21 per 100,000 people recorded in 2014. 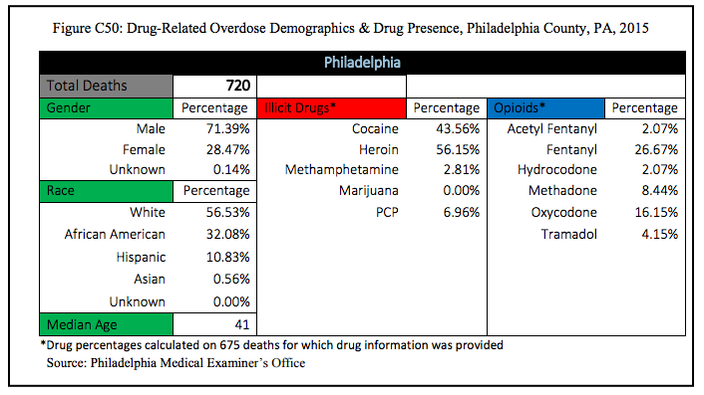 Philadelphia topped the state's 67 counties with a death rate of 45.93 per 100,000 people, though drug overdose deaths increased by just 10 percent. 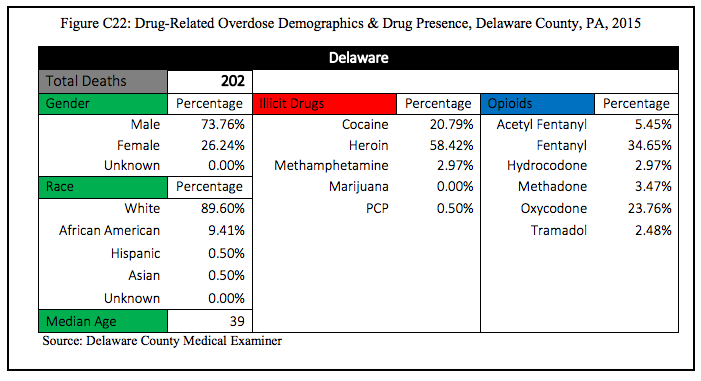 Delaware County recorded 35.82 drug-related deaths per 100,000, the sixth highest rate in the state and a 41 percent increase from 2014. Bucks (18.65), Montgomery (16.60) and Chester (12.21) ranked 35th, 43rd and 53rd, respectively. 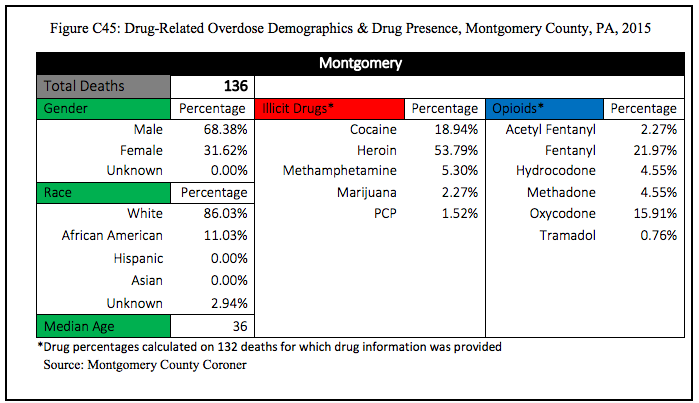 Montgomery County's death rate declined by 16 percent from 2014 while the rates in Chester and Bucks counties remained at or near the same. Heroin was the most frequent drug identified in toxicology reports, appearing in nearly 55 percent of drug-related overdose decedents. The appearance of heroin or at least one other opioid was reported in about 81 percent of decedents. 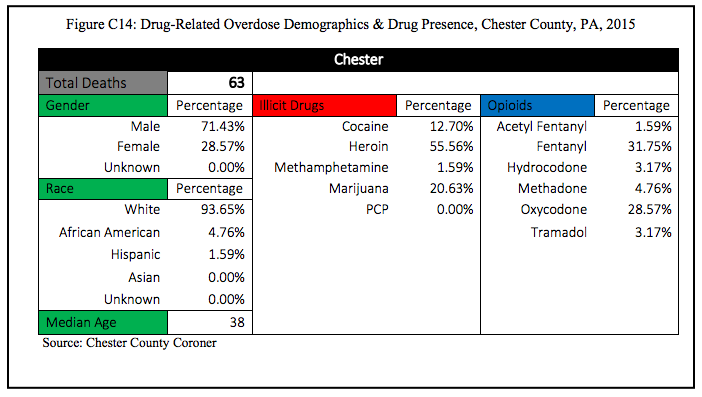 The presence of heroin rose by a staggering 400 percent in Chester County while dropping by 1 percent in Philadelphia. It jumped 37 percent in Bucks County, 19 percent in Delaware County and 13 percent in Montgomery County. Fentanyl was found in 27 percent of drug-related overdose decedents – a 92.9 percent increase from 2014. Heroin is commonly laced with fentanyl – about 36 percent of fentanyl-positive decedents also tested positive for heroin. Another 26 percent tested positive for cocaine. The presence of cocaine in all toxicology reports jumped 41 percent from 2014, the biggest increase among illicit drugs. 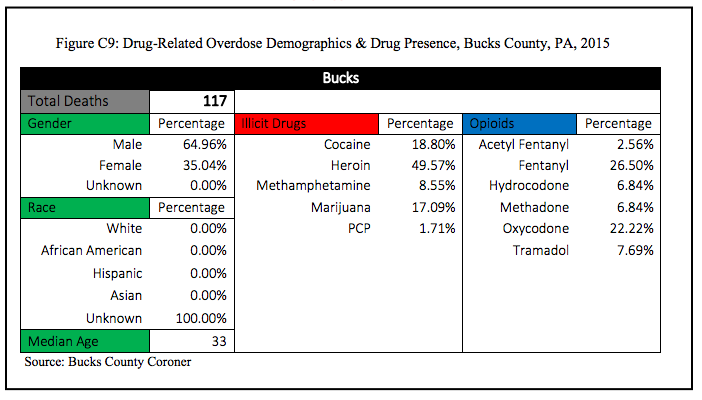 Cocaine presence increased 63 percent in Bucks County and 53 percent in Delaware County. It jumped by 14 percent in Chester County and 8 percent in Montgomery County. In Philadelphia, cocaine presence dropped 1 percent. The following graphics show more detailed demographical information from Philadelphia and its four suburban counties. To read the complete, 70-page analysis, click here.